Like most drinks, there are many ways to serve a Mojito. I usually serve this drink in the glass I mixed it in, leaving the muddled mint leaves and lime wedges in the drink for color. 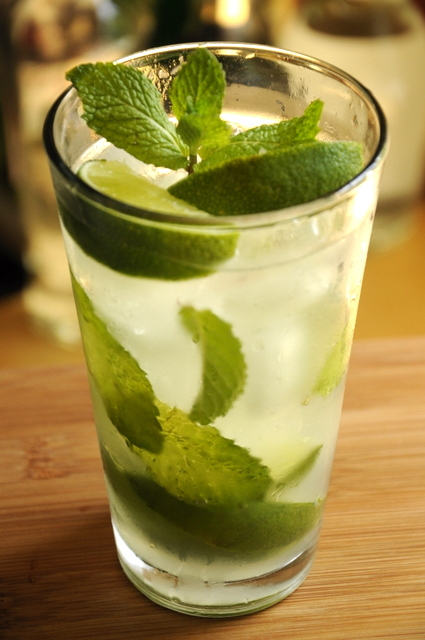 In a mixing glass, drop in the limes and mint leaves. Pour in the simple syrup and muddle until the juice from the limes is released and the smell of mint is present. Be gentle, don’t pulverize the mint or the limes. Pour in the rum, fill with ice and give it a shake to mix. Strain into a fresh glass filled with ice and top it off with soda water. Garnish with a lime wedge and a mint sprig. Have you heard of Coco Rico? It’s a coconut soda from Puerto Rico. The other day I made a Mojito using Coco Rico instead of soda water and didn’t add the simple syrup. It was pretty good! I haven’t tried it, but that sounds like it would be a very tasty addition to the drink. I’ll have to keep an eye out for it.